12th: Patrol from Nyack to Ossining. Check stranded containment boom on village waterfront. Confirm that the boom is not oil contaminated before retrieval. 17th: Retrieved a section of stranded containment boom from the village shoreline and towed it to the public launch ramp. Pulled it ashore with help from several members of the Ossining Boat and Canoe Club. 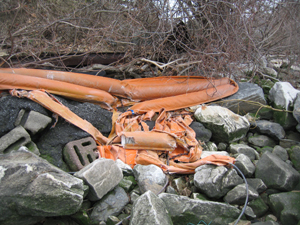 The village DPW agreed to dispose of the boom once we got it to the ramp.